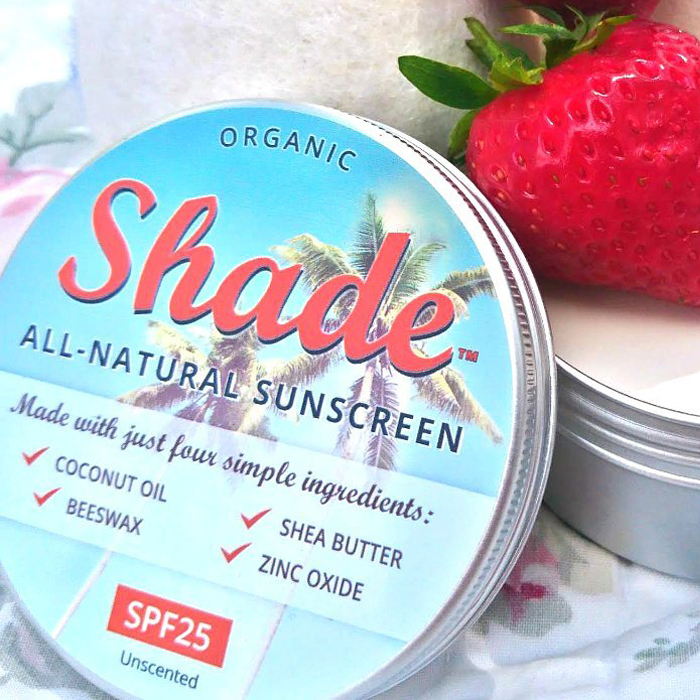 Shade™ All-Natural Non-Nano Sun Protection – Spf25, Unscented, Broad Spectrum (Uva1, Uva2, Uvb), Toxin Free, Organic, Recyclable Container, All Skin Types. 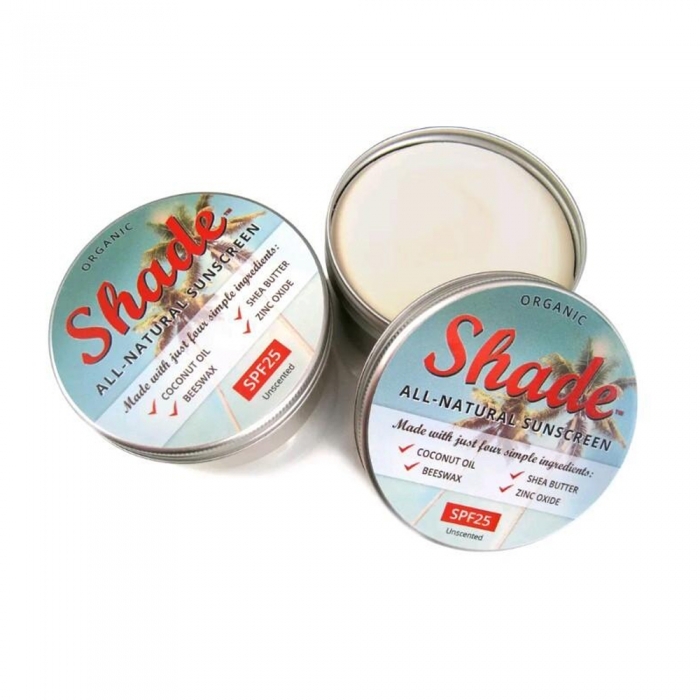 Shade™ All-Natural Sunscreen is an effective, natural sun cream which literally does what it says on the tin. 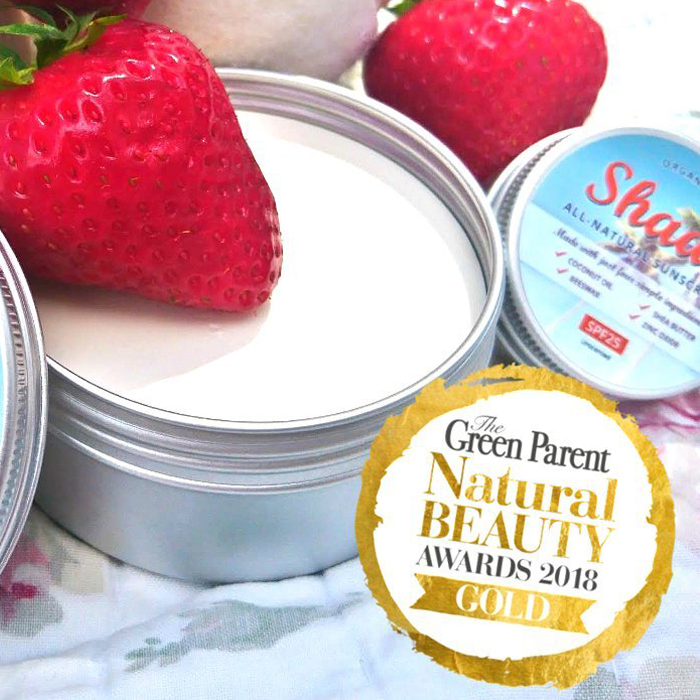 An award-winning product 4 years in a row. There is no doubt that you need to protect your skin from intense sun which may cause skin cancers, but you need some sun to generate Vitamin D to help prevent other forms of cancer through insufficient Vitamin D. Exposing ourselves to the sun is the only way our bodies will make it for ourselves. Spending some sensible time in the sun, making use of hats, and light clothing is ideal, however, we can ensure to use Shade™ sun protection for the times we can’t avoid prolonged exposure. Unrefined Shea Butter Butyrospermum Parkii butter for skin conditioning, viscosity controlling. Coconoil™Virgin Coconut Oil*: perfuming, skin conditioning. Zinc Oxide 99.9% pharmaceutical grade highest purity available: skin protecting, UV absorber. 100% Pure Unrefined Natural Beeswax: emollient, emulsifying, perfuming. Zinc’s clumping effect – you may see the cream turn from a smooth surface to a rather mottled looking if you don’t use it up quickly. Again, this is a natural occurrence as zinc oxide crystals attract one-another due to their polarity. If this occurs, simply rub the cream into your skin thoroughly as you apply it. Application Apply generously. Works immediately. Reapply every 2 – 3 hours or after exposure to water or after sweating. Shelf Life Once opened, use within 12 months, otherwise, shelf life of three years.